A good friend of mine recently commented on an old game that I used to play on the Spectrum, namely Batman: The Caped Crusader. In a lot of ways, I do feel compelled to defend said title. This was Ocean's second Batman title, after the isometric Batman game released in 1986 and before the pheomenal Batman: The Movie (1989) that would set a standard for Ocean games for the years to come. Most of the 8-bit games coming out, at that time, were either bad clones of already great games and games written in Speccy BASIC (which, to be honest, were few and far between). Actually, I was a bit harsh with the last sentence. For the most part, games were in their infancy and games companies/developers were nowhere near the maturity that they are now (although I disagree with that maturity somewhat), but, because of the limitations in hardware and lack of major funding needed to create a game, it meant that there was always a new idea in how to make a new and interesting game. Batman: The Caped Crusader was one of them! The other thing about games at that time were that they were either full screen scrollers or flick screen, B:TCC changed that look by giving gamers a real comic book feel, in other words each room they were in was represented by a comic panel, which stacked on top of each other like Windows in the Window OS [Operating System]. 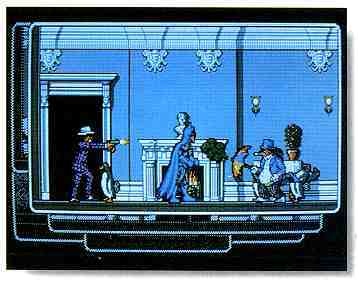 It had a fresh look on the action adventure genre, that had been made popular by the Wally series (Mikro-Gen), specifically Pyjamarama, by having Batman collect certain items to use in areas that would have a clue on the top left corner and the game was split up into two parts, side A was A Bird in the Hand, where Batman tries to stop The Penguin from creating an army of robot penguins, and side B was A Fete Worse Than Death, where Batman rescues Robin from the Joker. This was unusual because tapes (used to load the games) had the same game on both sides, just in case one side was faulty, the only other game that had a similar idea to that was Palace Software's Cauldron which had The Evil Dead on side B. This game, like most other speccy games, isn't easy. It has the right amount of challenge and doesn't disappoint. Side A (A Bird in the Hand) is easier than Side B and I generally use fly kicks at the enemy rather than the Batarang.